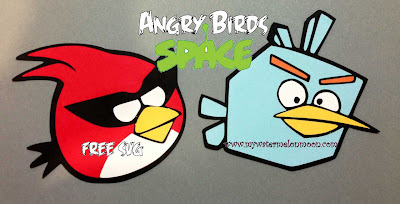 I had some fun this weekend making Angry Birds Space SVG files! I fixed red bird and finally made him into an SVG rather than Silhouette file. Then tonight, I made Ice Bomb Bird! Isn't he cute? I'm not sure which bird I will tackle next, but I plan to make them all in short order. My son LOVES anything Angry Birds. Anything. If you can't beat them, join them! Right? I am having lots of fun learning my new software and think that there will be plenty more SVG's where these came from of more than famous friends. 2. Comment below and tell me how you follow and your email addy. 3. These files are for personal use only. Don't put them on anything you are going to sell, ever! 4. Do not give away my files, they are my work not yours to give away. Instead direct friends here. They can get it from me free too. 5. If you use my files and post images anywhere on the internet, be sure to give me credit and link back to my site. I can't wait to use these little guys for my son's scrap book! I hope you enjoy them too! NEW: Request to have the files shared! Just Click these links and enter your email. I can approve quicker on this system! Thanks. This is so SWEET of you.Do not use SVG but I appreciate your kindness. Super cute! Would love to have these!! Receiving emails from '4shared.com' on your behalf. ????? Please verify. This is a great!! My children loves angry birds!! We going to celebrate his birthday, soon. tazunarq_7@hotmail.com Thanks for the SVG. you did a great job creating these ! My dgt loves angry birds and I was thinking of trying to cut them out of vinyl to decorate her laptop. I'm sorry I missed this one! I am sending via 4 shared! Hello Melisa!!! New follower here :) I would love if you could share this files with me, I am working on the black bird cutting file for a Bday party, this would be a life saver! thanks in advance! Sent to you via 4shared! thank you!!!! Have a wonderful day! Would love for my son's bday! I'm desperately in need of your angry birds space svg files, you did such a great job. Do you mind sharing them with me at ladylo97@hotmail.com? By any chance do you have chewbacca bird? My son really wants him and I thought I would ask. Much Mahalo! Sorry Jo I didn't make a chewbaca bird- but I will definitely add that to the t-do list :) Hope you enjoyed the files! Hi. I just liked/followed you on FB. I have a friend with an autistic son who loves angry bird space. I’m trying to get the svg. Thank you!